Moo moo! Buzz buzz! Pop pop pop! This call-and-response book by Dr Seuss explores the exciting sounds Mr Brown can make with his mouth and voice. See if you can do them too! Mr Brown Can Moo is a silly rhyming book that encourages children to imitate sounds through the use of onomatopoeia. It’s great for very young children who may have limited sounds in their speech inventory. Practice simple words like “hoo hoo” and “moo moo”. See the list below for more words. This book can also be used to encourage reluctant early readers to have a go at reading as the repetitive phrases like “Mr Brown can go like a….” and "how about you?" will give them the confidence to keep reading. 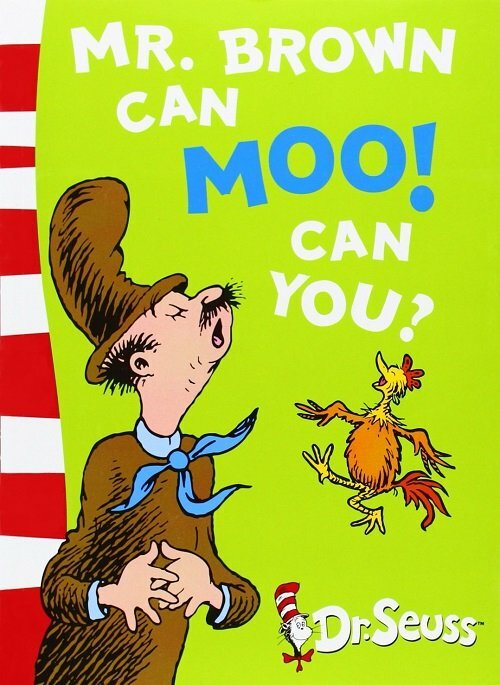 For further speech and language goals to target using ‘Mr Brown Can Moo! Can You?’, see the list below.